See ‘COURSE’ page for now…. Enquiries@atlantiscrystalhealing.com or use contact form. 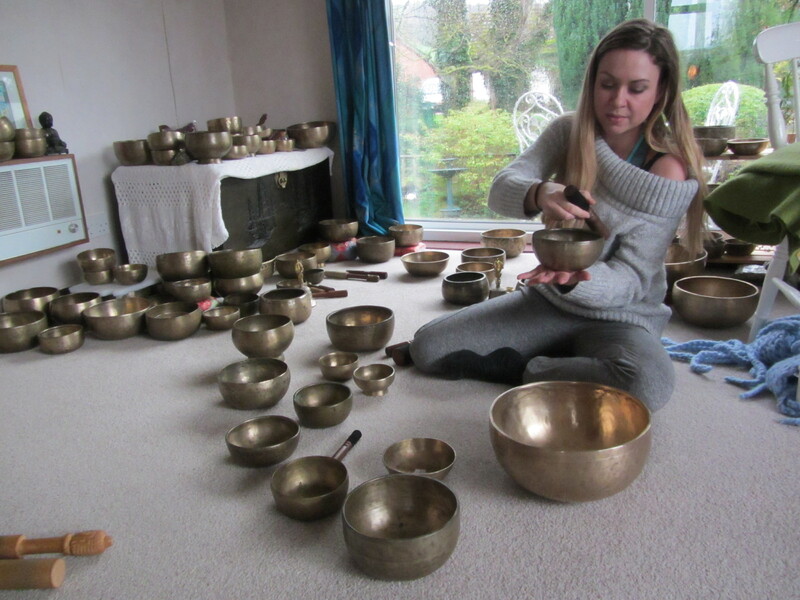 Allow me to introduce you to the amazing Ancient Authentic Himalayan Singing bowls and Nepalese hand made Gongs…. all lovingly hand-picked from the foothills of the Himalayas and here in their abundance for you to enjoy a journey of discovery with, and most of them available for purchase. Half a day of pure healing, joy and bliss. Why not give yourself this amazing gift? 11am – 2pm or 2.30pm – 5.30pm Enquire for date to attend. The following testimonial of the benefits of sound healing and for training here at Atlantis College, is kindly given by Margo Kean who has successfully completed the Sound Healing Diploma course this year, 2016, and is now a Practitioner, spreading her amazing sounds of light far and wide, especially where she is based in Edinburgh, Scotland. 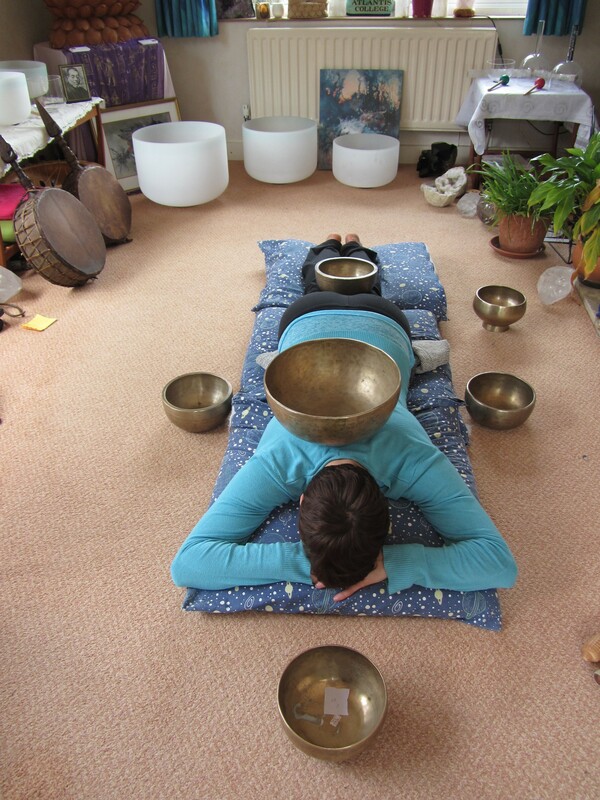 Thank you, Margo..
“The biggest benefit of sound healing, in my opinion, is the reduction of stress/anxiety. I believe that physical ailments stem from emotional/energetic blockages. Trauma, stress and pain from the past which has been suppressed then festers and can manifest itself in physical symptoms. 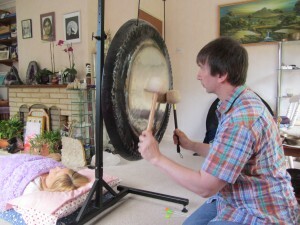 Sound healing treats the recipient in a number of ways; mentally by switching off the ego to re-set thought patterns; emotionally by allowing repressed feelings and blockages come up for release; spiritually by strengthening connection to source and physically by causing a change in brain waves to a deep meditative state allowing tension to ease. I loved my visits to Somerset to train with Lesley, she is so warm and welcoming. It was a privilege to be able to receive her teaching and knowledge and learn from her vast experience. The clearing which I went through whilst receiving treatments during the training was at times intense, however on retrospect it was simply a necessity. Much of the time during training I felt like a child at play, let loose on all of the beautiful collection of instruments which Lesley has accumulated. The setting in Doniford is perfect as it provides a tranquil setting surrounded by nature and free from interruptions. Lesley is so supportive and encouraging that I can do nothing but highly recommend Atlantis college to anyone thinking of training in sound healing. I have enjoyed every aspect of the diploma course and can’t wait to start practicing professional. Accommodation may be available (please enquire at time of booking). Otherwise there are plenty of b & b’s in the area. Exciting, inspirational and dynamic Sound Healing DIPLOMA courses to Practitioner level and also Advanced. Working on a one-to-one basis, or in pairs, cuts out the lengthy process of marketing and advertising, as well as enabling each person to go on their own specially designed tailor-made course. 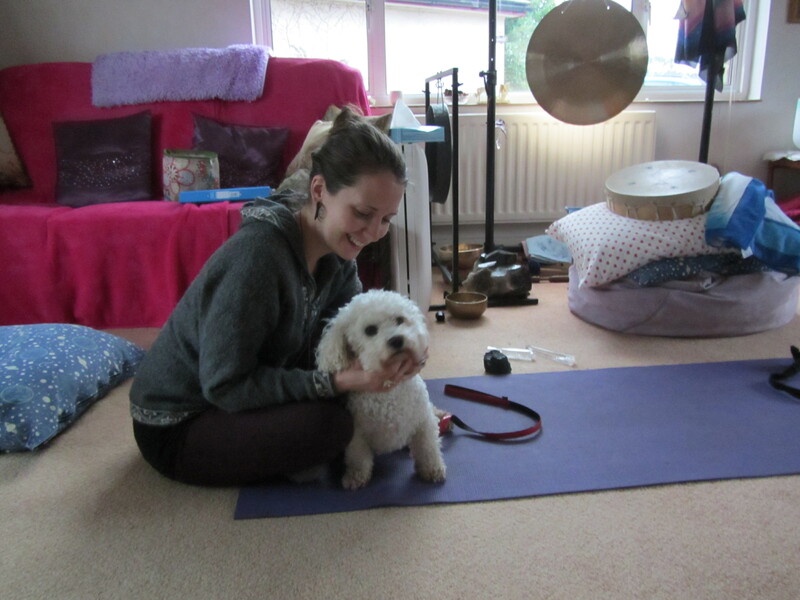 The emphasis of our courses is based on Holistic Intuitive Sound Healing whilst of course, being given background knowledge and information. It is to this end that the courses and tuition is based, whilst at the same time enabling the student to be able to receive professional tuition and qualifications to become a happy and confident Practitioner. You will be using your voice mainly for ‘Holistic Sacred Sound’, using a vast array of Sound Healing tools such as Native American drums, ancient Nepalese drums, rattles, Ancient Himalayan Singing Bowls, Crystal Singing bowls, Gongs, Sounding bowl, Tuning forks, ancient Mayan Peruvian Whistling Vessels and much more. The syllabus, training and sound healing method is unique to Atlantis College and is called the ‘ACST Method’. The Testimonials together with quality and quantity of qualified Sound Therapists trained by Atlantis College, speaks for itself. Please see testimonials to the left of this page. You are taught how to enable the pure vibrations of your divine essence to sound through you and to merge with the sound healing tool of your choice. You and the Tibetan Singing Bowl, for instance, are no longer separate forms. You become One as you merge together, leaving form and time as you explode in the ecstasy of timelessness and liberation of free spirit. From this place, you become all the sounds and the freedom of eternal spirit. You bring this knowing back in your physical being and you are transformed forever. This is an exciting, inspiring, healing and transformational experiential course for self awareness, spiritual development, awakening and helping to anchor the Light for self, others and our beautiful Mother Earth. For those of you who wish to use crystals with sound, this option is available in the course and also as one or two day workshops. This course will give you the opportunity to assist in re-attuning others and showing them how to stay in balance, harmony and centred in your peace within, despite what may be happening outwardly, as well as for yourself. Vital and much needed tools for these special times we are now in. An investment which can surely help to change your own life in the most positive way and to equally help others as an Atlantis College Sound Healing Practitioner, as registered, recognised and approved by the Complementary Medical Association, and member of Sound Healer’s Association. Every bone, every organ of our body, every part of us, resonates to specific frequencies or notes. When any part of us is out of synchronization, our notes get blocked or ‘off key’, which results in a very discordant sounding orchestra! This can result in dis-ease and low energy. By using sound healing, you will be receiving the notes, sounds and vibrations you need to place you back in a state of perfect harmony and well-being. It will assist in expanding your awareness dramatically; you will gain much more confidence and let go of inhibitions once you can let your voice express yourself and allow the different sounds of light to enter your being and flow through you. In receiving Sound Healing treatments or Sound Baths with Lesley Carol or anyone else who has successfully trained in this way with Atlantis College, you will be so relaxed and filled with pure Light of Source from the sacred holistic sounds, that your body will be able to fine-tune itself, re-harmonise and re-align once more, to its perfect note and sound, filling you with wellbeing.